I'm planning to start a garden railway in Waimea on Hawaii (the Big Island) when I make my move there permanent next spring. Until then, I'm trying to identify resources for materials, plants, etc. I have found that it isn't as easy to find stuff there as it is here in the Denver area. I've owned my home there since early last year, and have stayed for two two three weeks every three of four months. I'll be visiting for a couple of weeks in mid December (my last visit before the move), and was hoping to connect with some people who already have started garden railways on the island. Aloha a me a komo mai na Hawaii nei! There is a gentleman on this forum who publishes as "Neiler" who lives on Hawaii Island. He can probably offer you island specifics. 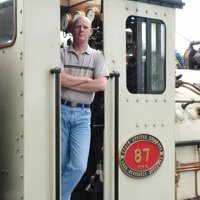 My own line, the Oberammergau, Ogden & Olomana, is on O'ahu, and I am a relative neophyte in the hobby, but I hope some general observations might help in terms of strategic guidance! The biggest challenge is the lack of hobby specific stores, especially as free shipping usually does not apply to us. I would go to your favorite store now and load out. You will save in the long run. For us, every run to the Mainland is a supply run, and I usually make a "strategic purchase" of needed and anticipated repair parts every 6 months or so to save on shipping. In between, the Triple O goes without. 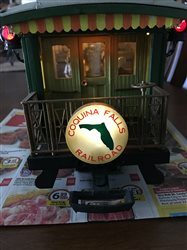 I am calibrating my eye, with the aidof Bill aka ChochoWilly who posts here, to see garden railroad potential in non-hobby items. The other issue is a total lack of cultural memory of railroads. Trains once served as the industrial backbone out here, but only a handful of tourist lines remain, and none on your island (There is a small museum and the remnants of a dual gauge whye and some rolling stock at the Luapehoehoe museum.). This means if you need help in some facet of construction, explanations, pictures, literature, etc. may not really convey your needs. Then you have the fun of adapting your plans to the reality of what lies before you! Microclimates are a thing. I have been living here about 20 years, and I am still shocked how little distance can separate a deluge from a sun drenched beach. I am hardly kidding when I say what grows on one of your street may struggle at your house! On the upshot, Hawaii Island seems to actually have used stuff come up on the market on Craigslist. Everyone assumes what they have is a "collector's item," which leads to "interesting" pricing. At least you'll be in a physical location to help sellers see reason! One of the resorts recently dumped about $15,000 of stuff at a third the price out that way. You never know! We are now a fraternity of three! Again, welcome to Hawaii! Mahalo for the info. I have already experienced some of what you're talking about. Regarding the microclimates. People a mile west of me need to water their lawns every few days or everything dries up while those a mile east need to deal with the constant wetness. Where I am, it rains often enough that the lawn is flourishing but hasn't needed water since I bought it, but it doesn't rain all that often and usually dries out nicely in between. A few miles down the road, the temperatures range from the 60s to high 90s, while I see high 40s to mid 80s (and have looked up at Mauna Kea from my driveway and seen snow in the middle of winter as well as August last year). I've also seen the rediculous range of prices on everything from furniture to cars. Even for such routine commodities, the variety of stuff available at any time is very small compared to large cities, as is the number of potential buyers, so if you really want something and are lucky enough to find just what you want on Craigslist, you may need to pay a premium, while if you have something you no longer need, you can't expect to make an easy sale, and will probably not get a decent price. I'll try to stock up, but don't know exactly what I'll need yet. I do have some key items that I've had for many years, and there's a big hobby show coming up here if a few weeks, and I'll certainly be looking for deals there. If I was starting from scratch (I started with the family's mothballed collection), I would invest in the track (longest lengths available), rail clamps, and, if required, the railbender. I'd then invest in one train that has exactly what I wanted and its power source (track or battery). What comes available on the used market tends to be "starter sets" with 12" sectional track and the usual list of starter set trains. I've been warring against the connectivity issues associated with 12" sectional track from day one. It's what I had. Locos and rolling stock, of course, will come with shipping costs of up to 25% of base cost. May as well have the moving company ship it! If you are handier than I, you can make your own structures, and you can get any power tool you want, at least on O'ahu, so I would put my lowest priority on tools and buildings. My plan is to hand-build track using redwood ties and 6-foot lengths of rail (probably Llagas Creek). I'd like to use code 215, but that either means aluminum or nickel silver rail. I don't like the look of aluminum rail, and the nickel silver is fairly expensive. I may go with code 250 brass, but that isn't much cheaper than the nickel silver and takes a few years to get a nice patina. For hidden track and storage areas, I'll probably use commercial tie strips. I'll look into a bender, but I may just try to make one. I'll probably try to find some decent redwood here in Denver for ties and bridges. I'm not too concerned about connectivity since I'm not planning to use track power - just battery and steam. I'll try to get some battery power components together before I move, and already have a couple of steamers (an Aster climax that I steamed a few times after finishing it about 30 years ago and an Accucraft Mason bogie that hasn't been steamed yet). I'm planning to scratchbuild any buildings, bridges, etc. I'm pretty well equipped for tools, and will be bringing most of what I have (and already have some basic tools there). My bigger concerns are building materials and plants. 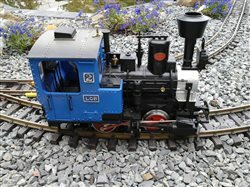 I've located a few sources of rocks and soil, but none of them list the crusher fines that Denver area garden railways usually use for ballast. I'm sure they must have something suitable, but still need to investigate. For plants, I haven't seen a lot of plants that scale well, and most plant nurserys I've found either specialize in large trees, or are part of a large home center (Lowes and Home Depot) and don't have much in the way of plants with smaller frames and leaves. One of the most useful plants in Denver area garden railways is the dwarf alberta spruce. I haven't seen those in Hawaii. They are supposed to be suitable for zones 4 through 7, but while my zone 11a setting doesn't get as cold as those, it doesn't get as hot either, so these may survive well. I've found a number of mail order options for them, but none ship to Hawaii, and it's hard to ship plants to hawaii since any live plants need to be shipped without soil. What part of Oahu are you on? I expect to get there ocassionally on business. Even though I'll be easing into retirement, my company has a small office in Honolulu and I'm planning to stay involved at least part time for a while, and will probably have some involvemnt in most Hawaii work. I was there briefly a month or so ago to meet some potential clients.